TIP: You can save products to your favorites list if you log in Thanks to the dedication of friends Emily and Mike McIntyre of Catalyst Coffee Consulting we are offering the Gelana Abaya/Semalo-Pride Mill in both natural and washed process variants…a great chance to compare side -by-side and see how top-shelf heirloom varietals shine in the hands of master processors. 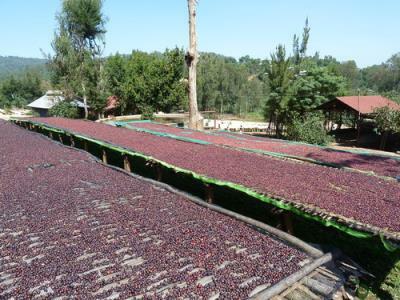 The Semalo project is relatively new and the McIntyres have been on the ground since the beginning working with the farms and the mill to elevate production and quality levels in this distant section of Yirgacheffe. Elevations range from 1850-2100 meters for the smallholder farmers. The Gelana Abaya natural (as well as its washed brethren) process Grade 1 just arrived and is sparkling, deep-hued and fruit-forward. Another worthy comparison on your cupping table could be had with the Yirgacheffe Hafursa Co-op natural process, another McIntyre gem. Sterling coffees any method, drip being our favorite. "Dipping one's nose into the bag of Ethiopia Sidamo Amaro Gayo reveals intense blueberries and woodsy aromas...freshly ground the bouquet is like a blueberry bomb, and in the cup its very nearly overwhelming...a heady commingling of earthy, woody fruits and bright florals poking through. Velvety in the mouth with a lingering finish of honey, cedar and fruit...an unforgettable experience...bravo!"